The Columbus Slot is a five reels slot with three rows and 10 paylines. This game has been around for more than 20 years and was developed by Novomatic. There are two variants, a 9 paylines version and a 10 paylines version. The latter comes from the Novoline Deluxe series which also includes Book of Ra, Dolphins Pearl or Sizzling Hot. The theme of the Columbus Slot is the navigator Christopher Columbus. The Slots has a Wild feature as well as a Free Spins feature as you would expect from Novomatic. Starting at 4p you can spin the reels up to a max bet of £100. 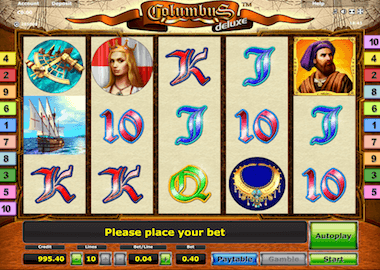 Symbols and Payouts: The Columbus slot has low paying playing cards symbols and some symbols matching the theme of Christopher Columbus. The playing cards 10, J, Q, K and A trigger a lot of smaller prizes in the base game. The theme icons are The Spanish Queen, a Diadem and a Sextant. These have higher payouts and land less often on your reels. The most valuable symbol is Christopher Columbus himself. This symbol also triggers the top win of 5000x your bet. There is also a wild and scatter symbol. Wild and Double feature: The Wild Symbols of the Columbus slot you already know. It is the Columbus symbol itself and thus your most valuable symbol. It not only has the highest payouts, but also replaces all other symbols except your scatter. Another feature is the Double Up feature. After every spin you have the opportunity to double your profit. As usual, you have to choose between two playing cards. If you choose the right one, you win and double your amount. You can double your winnings a total of 5x, but keep in mind that if you choose the wrong card, you lose everything. Free Spins feature: The free spins feature is the best bonus feature, because now you can make spins for free without any further bets. You trigger the free spins at the Columbus slot with 3 ship symbols. These are the same three ships Nina, Pinta and the Santa Maria, with which Christopher Columbus America discovered. The ship symbols must land on your reels in this order: Nina on the first reel, Pinta on the third and Santa Maria on the fifth reel. You then play 10 free spins in which your ships are additional wild symbols and you have an extra bonus symbol. The Columbus Slot is available in land-based casinos for more than 20 years. In online casinos, things look different. Novoline games are very rare and until today there are only a few casinos. These include the Energy Casino, LVbet Casino or the Videoslots Casino. If you do not live in the UK, you can also play Novomatic Slots at the Four Crown and Ares Casino. But you also have the opportunity to test these slots for free. We have a Novomatic site with free slots as well as a Free Slots site with more games developers. You can also test the Columbus slots by clicking on the banner above.